If you appreciate the work I have put into SiMi Clock and would like to support further development, please purchase this app. FriendCaster for Facebook gives you the best Facebook experience on Android devices! New UI design for Accounts/Login screen. New UI design for Popup notification. New "zip it" button in notification popup to turn off future notifications for that post. Changed default refresh notification "Checking Frequency" from 15 to 10 minutes. Fixed inconsistencies in default values when retrieving preferences. Fix for photos not showing up in News Feed. Overview: Portable mobile Wi-Fi Hotspot and USB Tether allows you to share 3G/4G Internet. Portable mobile Wi-Fi Hotspot and USB Tether allows you to share 3G/4G Internet. Make a portable mobile Wi-Fi hotspot or use USB to share your phone's 4G or 3G Internet with a laptop, tablet, or console. This is the "Pro" version with no restrictions. You can test the "Lite" version for free to see if it will work with your phone. This app is very hardware-dependent and only works with some phones. Designed for Samsung Droid Charge. NOT compatible with Motorola Bionic, Droid 2, Droid X, Bravo, HTC Thunderbolt, EVO, Photon, Rezound, Inspire, Samsung Epic, Intercept, Prevail, LG Thrill, Esteem, Casio Commando. 2012-01-26: Faster, bug-fixes, combined app for Wifi and USB, button indicators. 2012-01-03: Galaxy S2 (SGH-I777 on AT&T) now supported! 2011-12-29: Galaxy Nexus hotspot is working, though USB is not supported yet. Overview: Get WhatsApp Messenger and say goodbye to SMS! Overview: Download large files directly to your Phone with the best Torrent client! Download large files directly to your Phone with the best Torrent client! tTorrent is a torrent client for Android based devices. Please read the FAQ at the bottom of the page! "Easily the best torrent client for android, worth every cent. Congrats to the developer!" "Best torrent prog available for the android platform. I tested quite a lot of them." "I wish I could just shake you and say "THIS IS AMAZING!" I just can not believe how good this is compaired to anything else! Thank-you I love it!" The Pro version has no ads, and no download limit. Fixed search on Kickasstorrents, removed not working search providers. Auto download IP filter from iblocklist.com. Power management(download only when charged, battery limit). • Can filter apps by their Market link status. • Can attach a personal note to a backup. • Supports HTC HD2 external storage. • Improved Market Doctor analysis code (>10 times faster!). • Shows backup size in backup properties. • Properly disable all root actions if no root access. • Fixed bugs if Android Market not present. • Fixed possible FC when switching away from TB and then switching back later. • Some GUI tweaks (eg: scroll bar in backup properties). Download this apk file, open game and let it download data via wifi or 3g. That's done. Overview: Get your contact list whipped into shape in no time! Duplicate finder can match on name (including nicknames), full or partial phone number (like without area code), and email address. You control what gets merged and what doesn't. Use this to safely remove duplicates without losing data. Automatically find duplicate contacts based on name, phone number or email . Matches nicknames and partial phone numbers when searching for duplicates. Quickly merge any or all duplicates found. Select only contacts from your phone's built in account. Select only contacts from your SIM card (if you have one). Select contacts by synced account. Move contacts between accounts, your phone, and your SIM card. Copy contacts between accounts, your phone, and your SIM card. Merge contacts with an intuitive and easy to use merge tool. View contact details right in the app. Edit contact details from within the app. This Concise Oxford Thesaurus is ideal for helping you pinpoint exactly the right word, whether you are writing a letter, preparing a report, composing an essay, writing creatively, or solving a crossword. Over 365,000 alternative words cover everyday vocabulary as well as more unusual and specialist words, and there is clear labelling of informal, dialect, literary, and technical items. Other useful features include thousands of example phrases helping you to select the correct word, and opposites and related terms clearly marked. In addition, over 400 boxed noun lists provide a wealth of information on a wide variety of subjects, from alloys and artists to wines and worms. 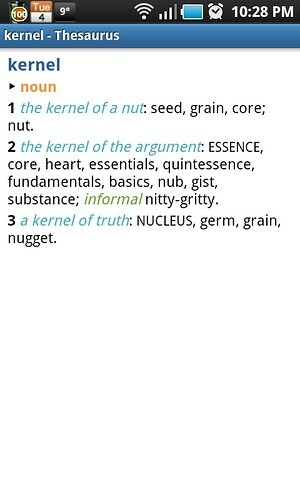 The Concise Oxford Thesaurus is utilized by MSDict Viewer. 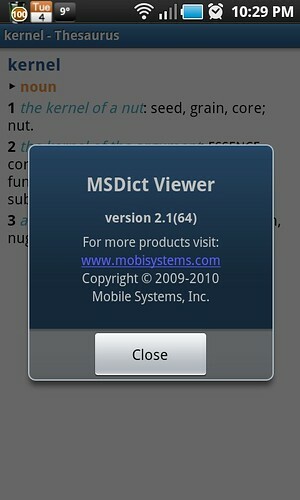 MSDict offers best experience in mobile reference and is available for any handheld platform. What is new in version 1.90? Note: You need not Wifi or internet connection for this application. Databases are included. Carefully read the instructions (included in the archive) before doing anything else. Overview: The Mozilla Firefox Web browser brings the best of desktop browsing to Android. Best of all, it puts the Firefox you know and love at your fingertips. It’s fast, easy to use and customizable, with the latest security and privacy features to help you stay safe online. The nightly channel is a snapshot of our very latest development work, before it is ready for widespread testing. This is our least stable update channel, and is not recommended for most users. Nightly builds provide an early preview of work that will eventually be included in Firefox 13 or later. Nightly will offer to update itself automatically about once a day with the latest changes from our developers. Firefox requires Android 2.1 or later and an ARMv7 processor. Installation requires about 17 MB internal or SD card storage. Firefox runs best on devices with at least 512 MB of RAM. Support for zip file names containing non ascii characters (e.g. Chinese, Cyrillic, Umlauts) and created by WinZip. Smart playlists editor: create custom smart playlists using many criteria (album, artist, title, rating, play/skip count, duration, year, last added/played, is podcast etc). Auto update playlist support. Overview: Beautify your caller ID screen! Set a full-screen photo for your friends and enjoy vivid and high definition caller photo. 1. Choose "Unlock Full Version"
2. Choose "Enter the key"
Bria Android Edition is a SIP-based softphone for your Android OS devices, brought to you by CounterPath – the award winning provider of desktop and mobile VoIP software products and solutions. Featuring superior security settings over other mobile VoIP products, Bria Android Edition allows you to make and receive voice calls over a Wi-Fi or 3G connection on your Android device via an easy-to-use and intuitive user interface. Bria’s enterprise-grade calling functionality includes the ability to swap between two calls, merge calls and perform attended and unattended transfers and more. You can send text-based instant messages and see when your contacts are available. Link to your Google Talk or Facebook accounts to chat with your friends in real-time. Add your enterprise IP PBX account and IM with other employees in your company or contacts in your address book. XMPP and SIP SIMPLE protocols supported. This feature can be purchased within the application under the Premium Features tab. Premium feature add-ons for Bria Android Edition also include a G.729 low bandwidth audio codec. This feature can also be purchased within the application under the Premium Features tab. • Headset with microphone: Bria uses the ear-piece and microphone on the headset. • Headphones (no microphone): Bria uses the ear-piece on the headphone and the built-in microphone on the phone. We have publish our second app called remote mouse, and we would really appreciate if you could tell us how it works on your device, and if you liked it. It control your PC/MAC smoothly, you must try it . Ads free version is remote mouse pro, your can search it at android market. No lugging your laptop around anymore. Connect remotely from Android device. Xtralogic Remote Desktop Client for Android enables you to connect to your Windows computers across the Internet from a mobile device powered by Google Android platform. Once connected, it gives you mouse and keyboard control over your computer while showing you everything that's happening on the screen. You can leave your computer without losing access to your files, applications, and e-mail. Xtralogic Remote Desktop Client is using Microsoft Remote Desktop Protocol (RDP). All the necessary server components are already part of most versions of the Windows operating system (except Home varieties). Overview: Everybody LOVES Big Buttons Keyboard! Learn it in a minute - use it forever! For the price of a sugary cup of coffee you can avoid your phone's tiny, frustrating keyboard buttons and enjoy the most advanced smartphone keyboard layout in the world. Do the 2-step keyboard install or your keyboard buttons won't get bigger!!!! Includes basic word prediction, error correction, microphone for voice-to-text (Android 2.2 and above), cursor keys, adjustable click volume, adjustable vibration feedback, more. Note - When installing ANY keyboard, you will receive a scary warning: "Attention - This input method may be able to collect all the text you type, including personal data like passwords and credit card numbers..."
Don't worry - Big Buttons Keyboard does not collect ANY of your information. Confirm this by looking at the permissions required for Big Buttons Keyboard. Big Buttons Keyboard does NOT access things like the internet, your email, text messages, etc. Big Buttons Keyboard sole purpose is to function as a keyboard. If you do not want Big Buttons Keyboard to learn and store new words you type into it's dictionary, then do not turn on the "Word Learning" option. Fix for inverted button colors on some Motorola phones. Improved bottom row of landscape keyboard. This one has the numbers and symbols with curve switched on! Problem is that the themes are on a Chinese site and I just can't figure out how to install it! 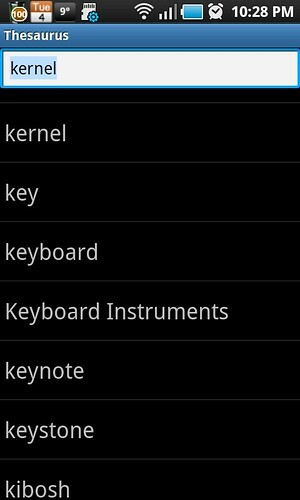 Overview: Take command of your Android device's touchpad keypad with a Perfect and smart Keyboard for android. Take command of your Android device's touchpad keypad with a Perfect and smart Keyboard for android. You can customize the look of the keyboard with eight different themes and add additional functionality to your device. Perfect Keyboard lets you use custom dictionaries, control background and text colors, and adjust the keyboard's vibration density. In short, Perfect Keyboard allows you to setup your Android phone or tablet's touchpad keyboard so that it works best for you. This is an iPhone style home screen launcher. The launcher makes your phone work just like a real iPhone. Overview: Get 4.0 on any Android device with Ice cream sandwich Launcher!